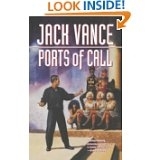 Long-awaited conclusion for the "Ports of Call"
Intentionally or not, "Ports of Call" and "Lurulu" are Vance's "Candide" in form as well as in spirit, and the very discernible morale of his story is surprisingly Voltairian: neither idealistic self-abnegation nor accidental wealth bring peace and fulfillment to human mind. A man is best off doing something pertaining to his inborn nature, cultivating his chosen garden and spending his free time taking a dram or two of "ardent liquor" while conversing with his good old friends. "Lurulu" is a wise and somewhat tired ending to the less tired "Ports of Call." It brings the scant plot threads of "Ports" to their disparate conclusions -- sort of. 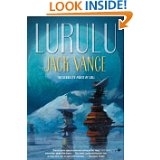 One of the main ideas of both "Ports" and "Lurulu," however, is not the plot in itself, it is a farewell kaleidoscope of Jack's favorite planet-vistas, which become noticeably bleaker and sketchier to the end. The other major idea of these two half-books is a search for the nature of human happiness, fulfillment and destiny, which is shown to be quite futile. The best thing in life is, Vance concludes, a relative isolation of a small group of the detached observers of life, preferably well-heeled, in the constant state of mental, emotional, and physical escape. Dismal thoughts it evokes, indeed. Life is not unlike an onion of delusions: the more you peel them, the more you cry, and in the end there's nothing. Many Vance's readers would feel that these last two books are anticlimactic, overly schematic, too founderous, even unconvincing time to time, and -- let us not mince the words -- lacking in novelty, in engrossing situations and in well-shaped, likable characters. All true. Even Vance's fortissimo, his descriptions of alien landscapes and weird customs, are devoid of their former vividness and conviction. Reconsider, however. Maybe "Lurulu" is not such an anticlimax after all. Jack Vance always had a penchant for the cold, somewhat frustrating touch of reality in the last paragraphs of his books. Perhaps, "Lurulu" serves well as one large, cold, somewhat frustrating conclusion to all of his life's work. It has no end, but I loved it.